FSR introduced its new Power Coaster Mini Table Box Series at InfoComm 2013 in the Orange County Convention Center, Orlando, FL. FSR is a manufacturer of audio and video switching, control products, and connectivity boxes. Their new Power Coaster mini table boxes can be used for meeting, conference, and classroom applications. The table box covers protect and conceal the connectors below and resemble a high-end coaster when closed. The covers are available with either black or aluminum anodized finishes. A variety of connector options are available. 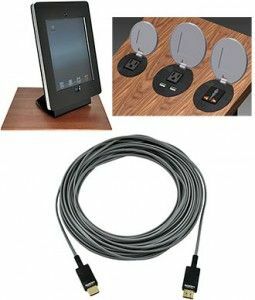 These include Universal AC power receptacles and dual USB charging ports. Installation is accomplished by simply drilling a round hole in the table. The AC outlets can be ordered in US, International Universal, UK, or Australian forms to satisfy most international markets.